Combine oil & spices in a plastic bag. Rub smooth side of each chicken thigh lightly with oil/spice mixture. Unroll each thigh and place flat on broiler pan, smooth side up. Set aside. Place potato wedges in plastic bag with the oil/spice mixture. 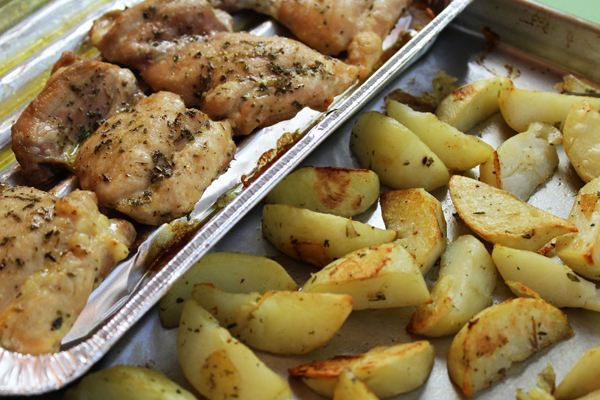 Rub to coat potatoes and place them on the large baking sheet. Add a bit more oil if needed. Slide potatoes to one side and place the broiler pan on the other side. Bake for 30-35 minutes, stirring potatoes once or twice. Thighs should register 165° - 170° F when cooked. 19 Comments on "Skinless Chicken Thighs & Fries"
I simplified this recipe so it’s much easier and faster now. I found that by unrolling the thighs, they were cooking faster so I just put everything in the oven at the same time and both the chicken and potatoes cook in about 1/2 hour. This is still one of my favorite fast meals. What does it mean to unroll the thighs? Thank you. Not the OP, but they probably mean they flattened the thighs, either with a meat mallet, or they butterflied them? Boneless thighs often don’t lie flat when you buy them. The thighs I buy are sort of rolled up (like a cupped fist) with a smooth top showing so I just “unroll” and lay the thighs flat. I hope that helps. Can I just put foil on the rimmed baking sheet? Or is does that ruin the recipe? You can’t use foil because you need to get under the potatoes too stir them and the foil would tear. The chicken has to cook on a broiler pan so that the fat runs off but not into the potatoes. It’s there in my photo but if it’s not clear, you can google for images of broiler pans. Oh Jenny….you are so down to earth honest. I am Polish also. 100% straight from Hamtramck Michigan. I am so excited to have found your site. I have been trying to watch all your video’s. you make it look so easy. How long do I fry non marinated chicken drum sticks? I’m sorry but I have never fried chicken drum sticks. (I’m just a home cook, not a trained chef). i JUST FOUND YOU AND CANNOT WAIT TO TRY SOME OF YOUR RECIPES. I AM HAVING FUN JUST READING THEM AND WATCHING YOUR VIDEOS. THANKS YOU SO MUCH AND I WILL WRITE AGAIN AFTER I TRY SOME. hi Jenny…I have nothing but fresh herbs plants…will it taste as good? Thanks! I have only used dried herbs, which are more potent, so I’m not sure. I’m afraid that fresh herbs might burn in such a hot oven. But I believe this chicken would taste good just with salt & pepper, or if you have any dried spices of any kind that you like you could use them instead of mine. Didn’t you already have a show???? I think you are perfect where you are in your retirement doing what makes you happy. 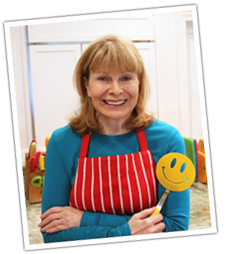 We love your recipes and all your funny wonderful videos. Continue to do what you are doing. I Love you and thanks for the Recipes to make us feel good about eating healthy without going to the rice cake and tofu menu. Skinless chicken and fries I will try soon. My bio is available there under the “About” link at the top.